Christopher Guerrera on Good Morning America Shark Tank! On December 5th, the Dust Deputy® made its national TV debut on Good Morning America’s Shark Tank – Holiday Edition with Barbara Corcoran! 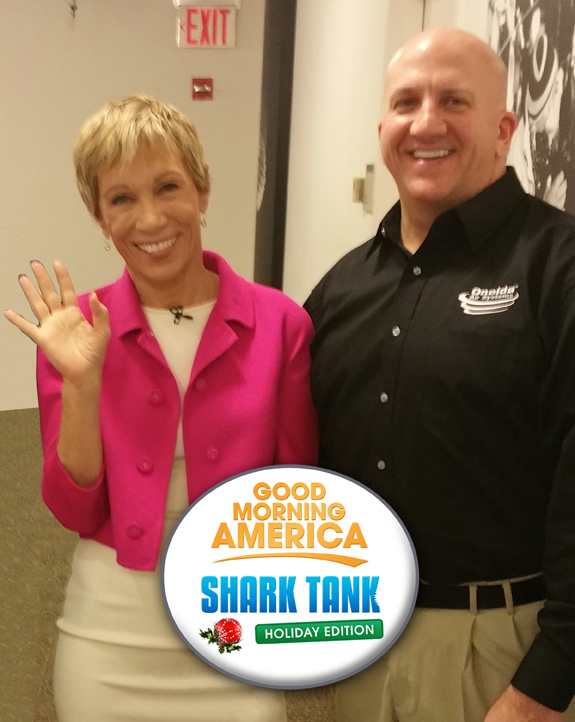 Christopher Guerrera was in the GMA Shark Tank studio pitching our award-winning Dust Deputy® product speaking with the Shark Barbara Corcoran and George Stephanopoulos ABC News’ Chief Anchor. He also serves as anchor of “Good Morning America,” and anchor of “This Week with George Stephanopoulos. The patented, award-winning Dust Deputy cyclone will transform your vacuum and the way you work! Standard wet/dry vacuums rely completely on their filter to capture and remove airborne dust particles which results in rapidly clogging filters and dramatically reduced suction after short use. The Dust Deputy® system captures over 99% of dust before it ever reaches your vacuum, virtually eliminating filter clogging and suction loss! With the Dust Deputy you’ll significantly extend the life of your vacuum and filters; saving you countless time and money on replacements! The Dust Deputy® is injection molded from a translucent anti-static resin and is offered in several types to fit your shop. Most importantly, like all Oneida Air products the Dust Deputy® is Made in the USA under strict Lean 6 Sigma guidelines utilizing the PACE (Productivity And Capacity Excellence) System. Here are some photos from our latest visit to the Good Morning America Studio! This entry was posted in Achievements, Articles, Events, National Media on December 12, 2014 by Admin.